I hate wet feet. Whatever I am doing, wet feet ruin the experience. There are a couple of places I don't hike right now because I know I will end up with wet feet. These include Telegraph Slough near Anacortes and the West 90/Samish Flats site near Samish Island. 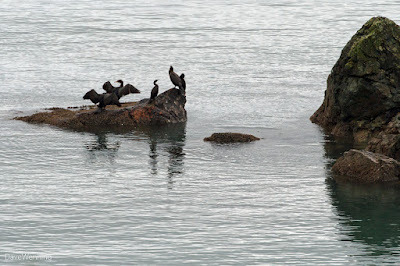 The latter is one of the best birding sites in the area. I have been shopping for waterproof hiking boots, but I am having trouble finding what I want. I am looking for something comfortable, not exorbitantly priced and that will fit my weird feet. I have high insteps and they are not the same length. I like sneakers because they quickly adapt to my feet. They work great on dry ground, but if there's any wetness around, I end up miserable. I have also had trouble finding shoes that didn't end up hurting. I have learned a lot reading the review sites for hiking boots. As is often the case, however, they seem to be all over the place with recommendations. Most of them are out of my price range. I am not a super stud elite hiker. Shoes costing $200-$300 and up seem like overkill for me. I just want something comfortable that will keep my feet dry. I was at Macy's the other day and noticed a pair of $75 waterproof hiking boots on sale for $35. They weren't a brand I'd ever heard of, but the price was right. I decided to give them a shot. The clerk found a coupon that took off another four bucks, so I ended up paying $31 for them. 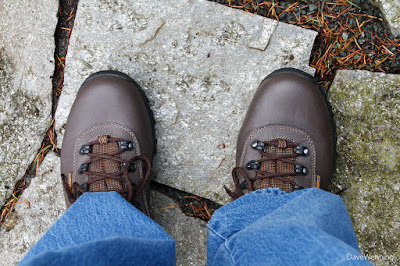 I donned my new boots and headed over to Deception Pass State Park to try them out on the Bowman-Rosario Trail. 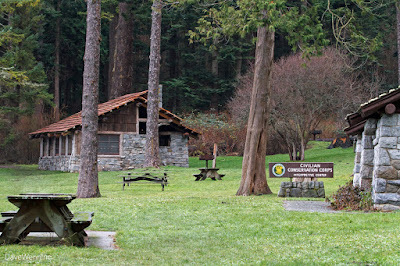 With my sneakers, the rain-soaked lawns of the Bowman picnic grounds would have meant instant wet feet. I made it all the way across the lawn to the trail head with dry feet. So far, so good. From the trail, I spotted this sailboat moored all the way across Bowman Bay. Restless Wind was her name, but not today. 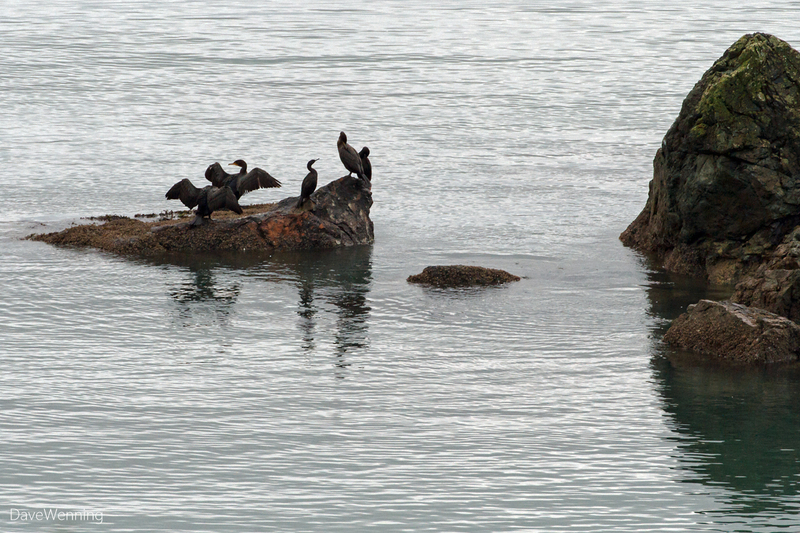 The cormorants were resting and drying their wings in their usual spots out on the rocks in the bay. 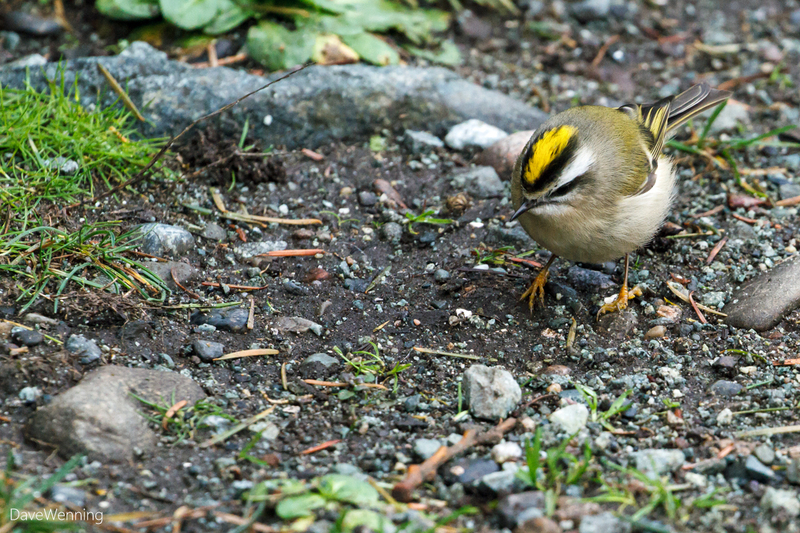 I had some usual experiences with Golden-crowned Kinglets. There were dozens of them along the trail all the way to Rosario and they were fearless. 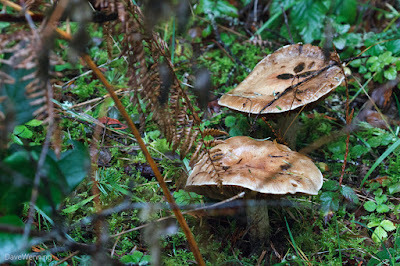 Busily foraging on the ground, they would skitter right around my feet. One acted like he was trying to run me off. They are extremely difficult to photograph. I have been trying for a long time. They are tiny, never stop moving and they're fast. I managed a couple of shots that weren't blurry, but I still couldn't catch their eyes in the photos. It's the eyes that engage viewers of bird photos. Out at Rosario, I found the recycling crew still working, even in late December. A lone kayaker was paddling in Rosario Bay, adding a bit of color to the shadowy overcast day. When I got back to Bowman Bay, I took a photo of the CCC worker statue. 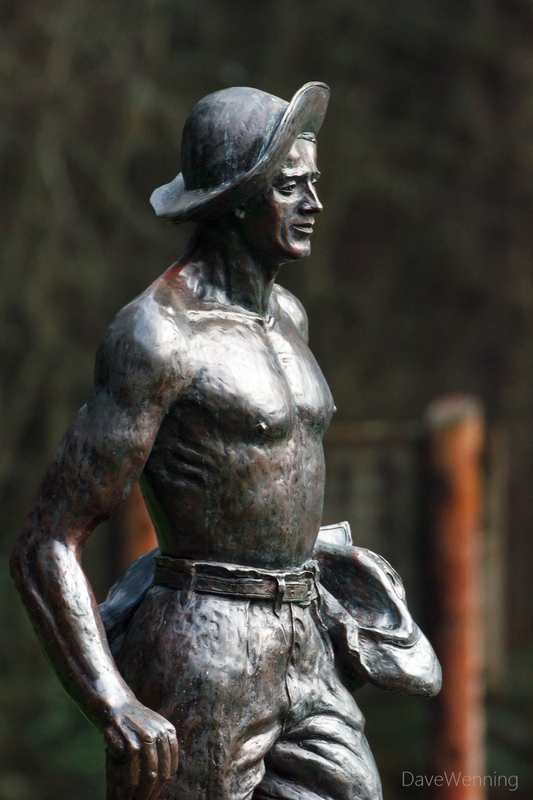 There are several of these around the country commemorating the heritage of the Civilian Conservation Corps. Before heading home, I checked out the Bowman Bay beach restoration work done last month. 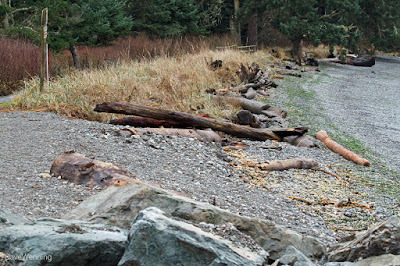 The rip-rap seawall between the boat launch and the fishing dock was removed. 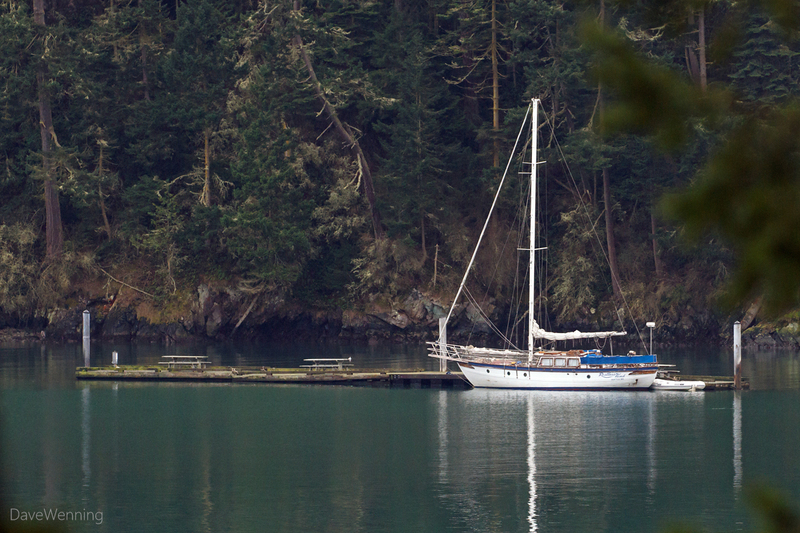 This will allow improvement and normalization of the nearshore habitat. 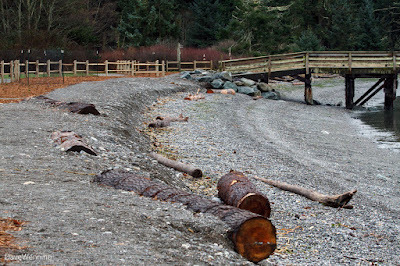 The bark mulch areas have been replanted with native plants and a new log fence erected to protect the site. I read that new interpretive signs will be added to educate the public about the value of preserving these habitats. 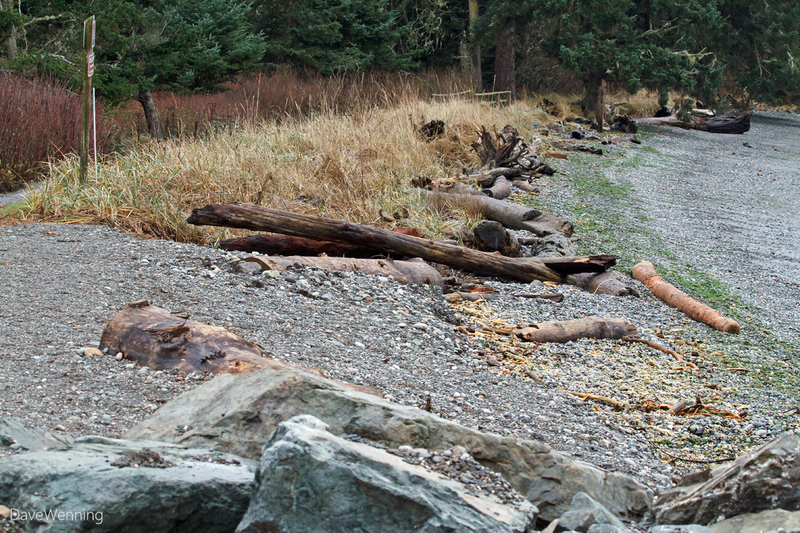 The area south of the fishing bridge shows how the restored beach will eventually look. Natural soft armoring with grasses and driftwood accumulation will stabilize the shoreline and allow upland sediments to nourish the beach. 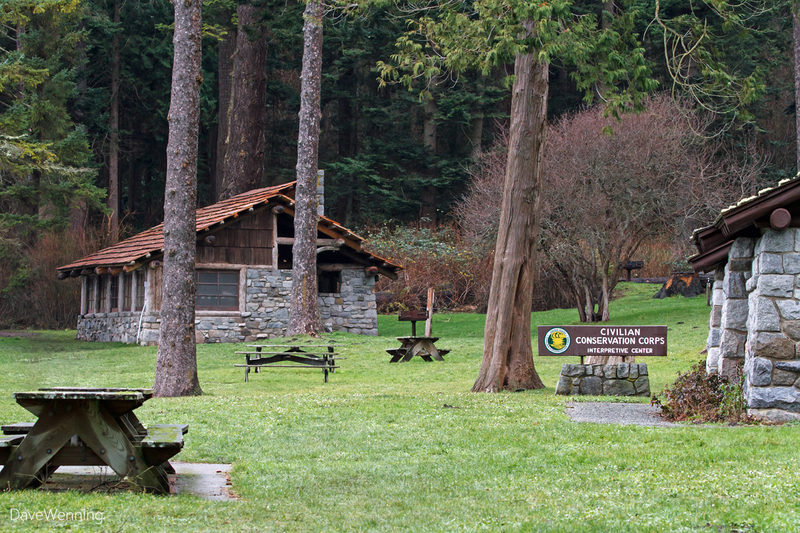 Park Manager Jack Hartt has made it his mission to preserve both the natural environments and the historical heritage of the park. My new, cheap boots worked out well for the hike. I happily made it home with dry feet which was my goal. 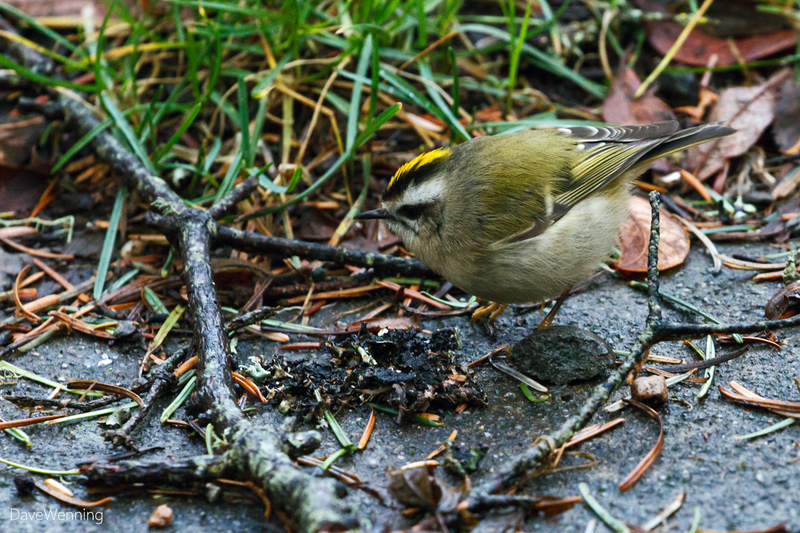 But after I sat for a while to look at the photos I took, an old familiar sensation returned. My right foot began to hurt in the instep. The foot was telling me, nope, not these. 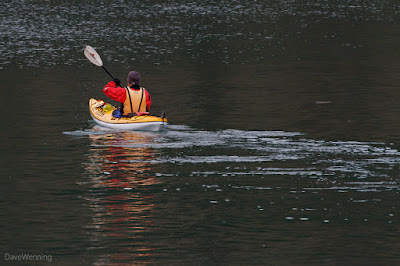 So, I am still looking for comfortable, waterproof hiking boots. If you have recommendations, I would enjoy hearing them along with your experiences wearing them on the trails. I have had success with waterproof socks. I usually use a thin liner sock inside them and whatever shoe is comfortable (though tied a bit more loosely than otherwise). Have you ever looked at Bogs boots? I've suffered the same as you, always wet feet. I have hiking boots I like, but they're worthless for keeping dry. Recently I got some ankle high Bogs. They're - so far - really comfortable and absolutely keep my feet dry. They also have insulation to keep feet warm down to something like 5 degrees. They're not cheap though, they run just over $100 for the taller ones, but mine were closer to $80. I've never bought such expensive shoes before, but considering all the adventures we go on and how wet the ground is here all the time I thought it was finally worth it. We also invested in Bogs for our daughter for her outdoor forest preschool. She wears them every day and she always comes home with dry and warm feet. Whenever I ask if her feet ever get cold, she always says no. Three months in and they're still as good as ever. I'm sure she'll outgrow them before the wear out. I simply love the writings. You've come out with such mesmerizing words.And I wanna comment that you must have got the best work boots for men .